One day in Ulan Ude, Russia! Capital of the Buryatia Republic and the buddhist capital of Russia. A whirlwind of some of the best sites the city has to offer. 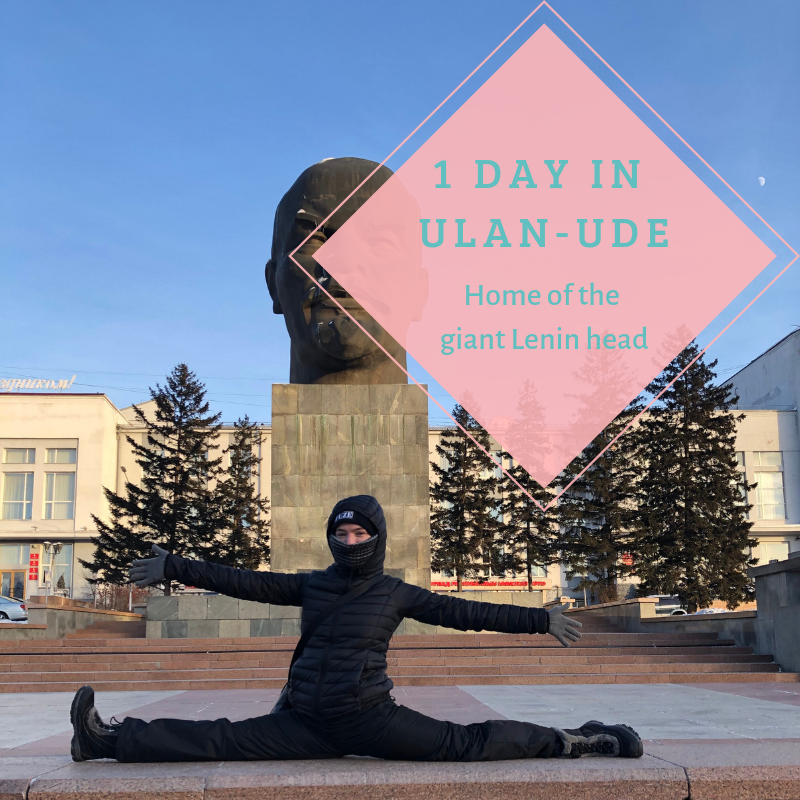 With the temperature at a balmy -18 degrees, today was the day we set out to see Ulan-Ude! We started with a walk to the Uda River and took a walk along the edge. It was totally frozen over and looked really beautiful in the sunlight. We could see foot prints in the snow from where people had been walking across but we were reluctant to give it a go, just in case! The river walk took us past the Holy Odigitrievsky Cathedral or Cathedral of Our Lady of Smolensk. Although simpler than many of the Russian Orthodox Churches we have seen, its golden roof was pretty in the sun. During the Soviet Era, the Cathedral was used as an anti-religious museum but has since undergone renovations. Next, we strolled up Lenina street, the main shopping street that is partly pedestrianised. The street itself was fairly average but conveniently took us past nearly all the sights we hoped to see that day! Our first stop was a Monument to the Fighters Who Fell for Communism. A large obelisk just off Lenina street, on a square filled with ice sculptures and a little ice slide! We also saw one of the many stray dogs in this part of Russia and he followed us for a while – so cute! Monument to the Fallen Fighters for Communism. By this point, we were really cold since we had walked around for a few hours in sub-zero temperatures. So, we decided to stop in a cute little Travellers Café for a coffee and pancakes lunch. From the bottom of the street you can see an arch, Triumphal Arch or The Tsars Gate, dominating the view up the slight hill. After lunch we finally reached the top! On the eve of the visit of Emperor Alexander III, the city merchant society proposed to build the Triumphal Arch. The imposing arch lead us nicely to Ulan-Ude main square, which contains one of the cities most celebrated and landmarks: a colossal Lenin Head Monument. The square was full of various ice slides and sculptures and busy with local people enjoying the fun. You can just see the Lenin head in the back ground – we were standing as far from the head as possible for this shot! We had a lot of fun posing with the Lenin head! Standing at 7.7 metres tall and weighing 42 tonnes it was a novelty we found incredibly impressive and surreal. The communist ruler, unsurprisingly much better remembered than other leaders such as Stalin, is immortalised in this city. It continues to be a popular meeting place and even wedding photo shoot site, long after the fall of communism. The giant bronze Lenin head monument, built in 1970 for the centennial of Lenin’s birth, still presides over Ulan-Ude’s central square. Our next stop was a brief jaunt over the railway line to visit yet another of the many Orthodox churches Siberia has to offer. St Nicholas church was a beautiful building, but much the same as many other churches we have visited. We didn’t stay long, preferring to forage for some warmth and tasty food instead. A long, cold and dark walk all the way back down Lenina Street found us visiting the small Ethno café right towards the southern end. The prices were crazy cheap and the food was delicious! The Buuz, other wise known as dumplings and the national dish of Mongolia, were so gorgeous that we ordered an extra two each after finishing the first batch. They also had a good range of other dishes to choose from and we happily ate broccoli for the first time in who knows how long? I have been craving veggies since we entered Russia but they are increasingly difficult to find and afford the deeper into Siberia we go! They also had cake which James surprised me with and honestly, I couldn’t have been happier! On the way home we briefly looked at the Great Patriotic War Memorial. It was dark so made for a terrible photograph. However, you can see the figures on either side of the eternal flame and make out the huge tank on the top. A site I wish we had made the effort to visit in daylight. Today marked our final day in Russia as we prepared to catch our 2 night train to Harbin, China. Although sad to leave the charms of Russia behind, we couldn’t wait to see what China had in store. If we had the time, we would have enjoyed the Ethnographic Museum of Buryatia, Russia’s largest outdoor museum not far from the city centre and housing more than 40 architectural monuments! A late train however, meant only one thing: Ethno Café Round Two. Even though we only had one in Ulan Ude, we still had time for more Ethno Cafe! Full of delicious Buuz, we were ready to take on the next adventure… Harbin! If you enjoyed this articles don’t forget to share and like it! Harbin: Where the Police Double as Tour Guides…? Hey, I’m Charlie the Dancing Circus Traveller. This blog will focus mainly on budget travel whilst also trying to maintain or develop the fitness and skills I know you dancers and aerialist have worked hard to achieve; whether you’re a professional performer or simply a keen hobbyist. If you like circus, dance and travelling but want to combine all three, then you’ve come to the right place!